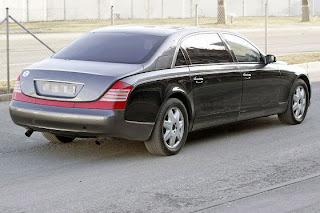 With the Maybach selling very, very slowly (1 sold in the UK in 2008, 0 sold in Australia and less than 1,000 sold in the U.S since it's launch in 2003. ), Mercedes needs to act fast, especially considering that the Phantom is out-selling it. Our spies were ready to pounce on Maybach engineers on the roads of Germany as the first mules were out testing. At the front, tweaked grille and bumper will feature, alongside LED daytime running lights, similar to the forthcoming S-Class. The rear seems unchanged, but we suspect that LED-tail-lamps will feature. Powertrains for both 57 and 62 models will stay the same. Sales are expected to start in 2010.